We know L-Carnitine has to do with weight loss? Or repairing muscles? Right? Well it is both those things but L-Carnitine is more than just that. It is actually produced naturally in your body, it’s a water soluble nutrient made up of two amino acids, lysine and methionine. It brings back and forth oxygen and fatty acids to cells where Co-Q10 helps convert them into energy. 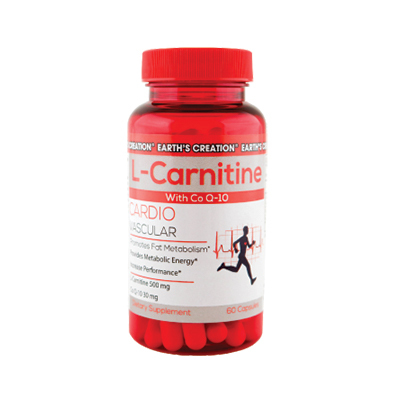 L-Carnitine is a non-essential amino acid that helps to maintain overall good health by facilitating the transfer of fatty acid groups into the mitochondrial membrane for cellular energy production. It is an important amino acid that can help transport fat to the muscle to be burned as energy. In promoting better utilization of body fat, it may help with weight loss and improve athletic performance. Co-Q10 an important antioxidant found in high concentration in human heart and liver; is part of the cells’ electron transport system; needed for ATP ( i.e. ; energy ) production within the cells. It is essential to the production of energy by every cell in the body. Co-Q10 is also a key antioxidant nutrient and may help maintain a healthy heart. By combining L-Carnitine and Co-Q10 , the best utilization of efficiency of Co-Q10 increases significantly, up to three times the effectiveness. Combining Co-Q10 and L-carnitine is the best way to get maximum absorption of this supplement formula.